British Airways is relaunching its UK regional airline, CitiExpress, as a budget carrier to compete with the likes of Easyjet and Ryanair. 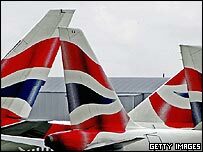 BA is reducing many fares by up to 40% as it seeks to regain ground lost to no-frills carriers in recent years. The airline, renamed BA Connect, will offer one-way fares for £25 from destinations including Bristol, Manchester, Edinburgh and Birmingham. CitiExpress was formed in 2001 by the merger of four regional carriers. The revamped airline - which serves UK regional airports - will begin flying at the end of March. Customers will be able to make reservations next month. BA has found it hard to develop its regional subsidiary in the face of the aggressive price cutting and relentless expansion of its rivals. Nevertheless, the airline still carried almost four million passengers last year, serving 32 destinations in the UK and Europe. The new service will offer two million flexible tickets a year for £25 while frequent flyers and business travellers will be able to book a more advanced service from £110. BA executives said the revamp was designed to offer a more attractive proposition while improving the airline's profitability. "The restructuring of the regional business will set us apart in this fiercely competitive market," said David Evans, managing director of CitiExpress. "The move is a direct response to changing customer needs and the challenges that have emerged in the marketplace since the creation of British Airways CitiExpress."